Former Chelsea midfielder John Obi Mikel has completed his return to England after joining Championship side Middlesbrough on a short-term contract. 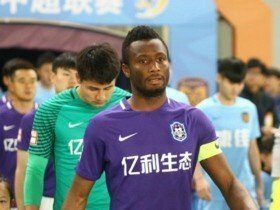 The Nigerian had spent the past two seasons with Chinese Super League side Tianjin TEDA but he had become a free agent prior to agreeing a deal with Tony Pulis' team. "I'm pleased to get him in. He is a man with a lot of experience and quality. He has a winning mentality and he wants to be here to be a part of what we are looking to achieve," Pulis told the club's official website. Middlesbrough have struggled to garner back-to-back wins over the course of the season but they have still remained aloft in the playoff race with their strong defensive displays. The Riverside outfit are currently positioned fifth in the league standings and they hold a three-point advantage over Bristol City, who are just outside of the playoff positions.